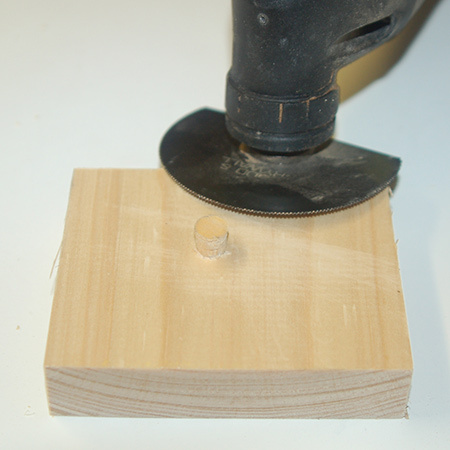 The trick for cutting wood plugs without a drill press is to make a template using a scrap of wood or board. You can make a single template, if you are only cutting a few plugs in one size, or a longer template for different sized plugs. To make your template you need a spade or MAD bit that is the same size as the OUTER diameter of the plug cutter you will be using. 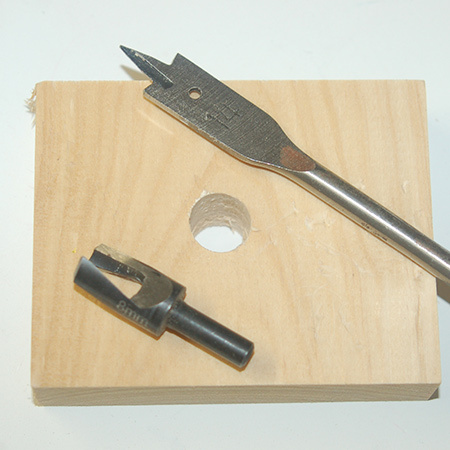 In this case we are cutting 8mm plugs, but the spade bit is 14mm - a perfect match. 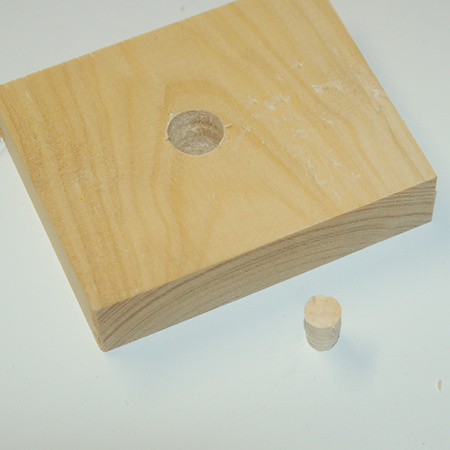 Use the spade bit to make a hole/s in your wood or board for the template. 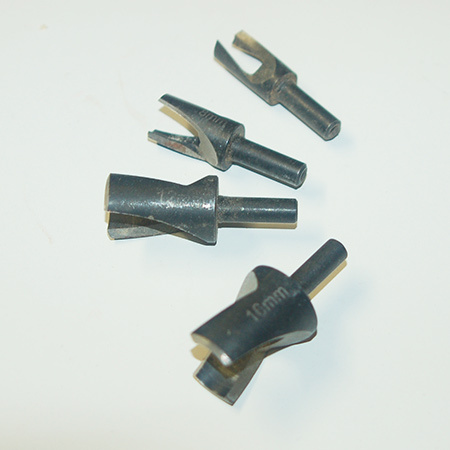 Remember that the size of the spade bit must correspond to the OUTER diameter of the plug cutter. If the size isn't accurate your plugs will not come out smooth. 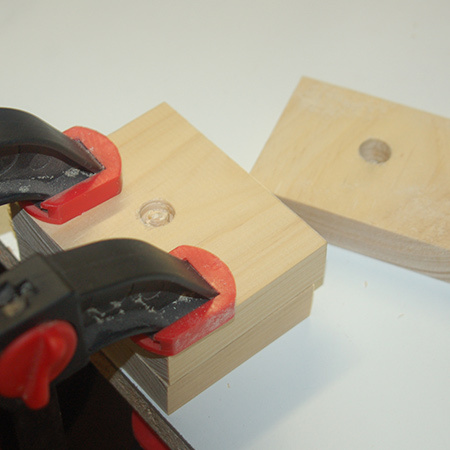 Clamp the template onto the wood you will use for the plugs, plus a sacrificial scrap of wood at the bottom. 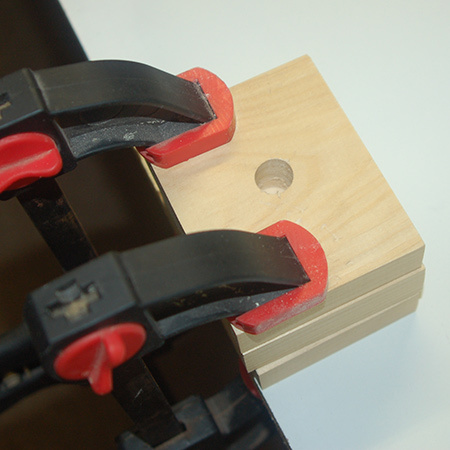 Clamp these three layers firmly to your work bench. 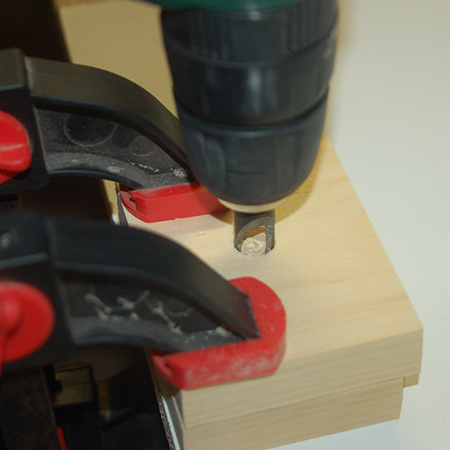 Secure the plug cutter in the end of your drill / driver and, on full power, mark the top of the wood for the plugs to a depth of about 5mm. Note: If your template block is thinner than ours you might be able to cut out the entire plug. 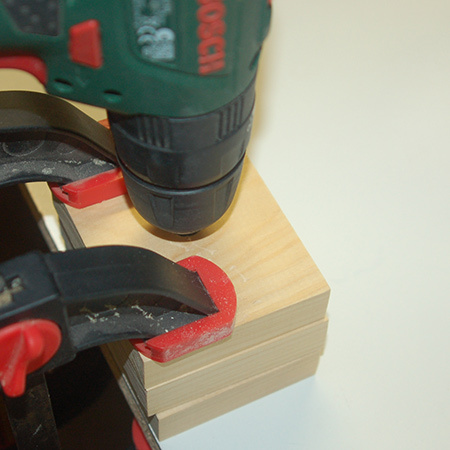 Remove the template to reveal the 5mm deep circular cut in your block of wood. Now you can re-insert the plug cutter and continue drilling out the plug without having to worry about it sliding around over the surface. 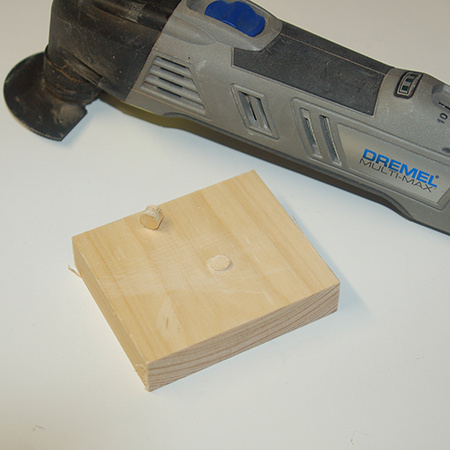 This is a super easy way to make your own plugs for wood projects. 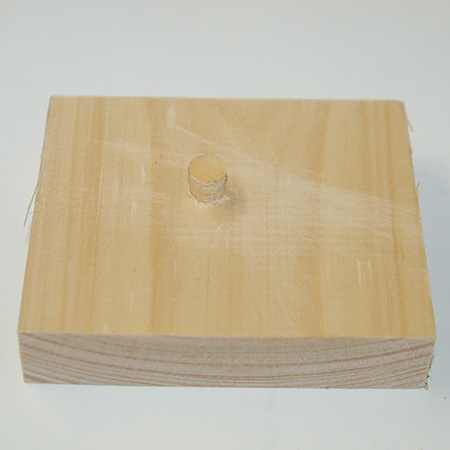 When fitting you plugs, add wood glue to the inside of the hole and outside of the plug and push the plug in place. A light tap with a rubber mallet will ensure a tight fit. When fitting a plug try to align any colouring of grain with the surface of your project. That way the plug will be almost invisible. Let the glue dry before cutting off the top of the plug. We use a Dremel MultiMax to do this. 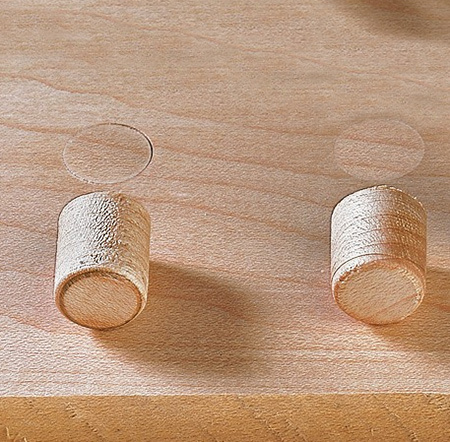 Leave about 2 to 3mm above the wood to avoid damaging the surface of your project. With the plug trimmed now all you have to do is sand smooth. 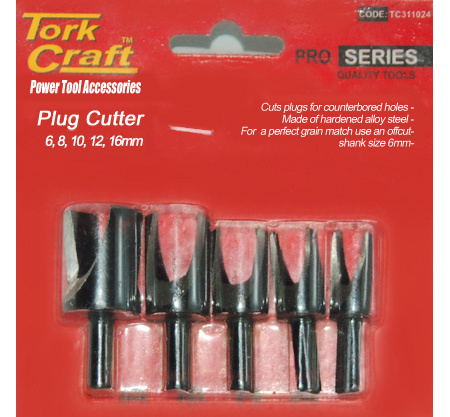 Buy Tork Craft Plug Cutters at your local Builders or hardware store.